Well, after watching the history of natural stone application in Greek, let’s look at another country with long history- Roman. In Roman, the empire rose to power around the dawn of the first century AD. 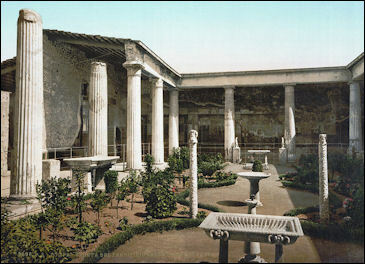 The Romans built extensively with both marble and granite. They were, above all, road builders, and they could find no better paving stone than granite. Though quarrying it was difficult work, they lined many of their roads with granite. Public baths were popular, and many were constructed of granite. The Romans also extensively used granite for columns, and ancient ones can be seen today in the Pantheon in Rome. While the Romans loved granite for its durability and strength, they loved marble above all else because of its beauty. Emperor Augustus once said of conquering a city, “I found a city of bricks, and left it a city of marble.” Unlike previous civilizations, the Romans built their structures out of brick and strong mortar, and then lined them with marble slabs. Because they were not dealing with huge blocks of heavy marble for the infrastructure, they were able to build more rapidly. Their technique is still used today in the construction of state buildings, museums, and monuments across the world. The Romans quarried marble and granite all over their country, but often found that the most beautiful marbles came from Greece. They praised the marble Cipollino of Karystos for its beautiful green color, and that same marble is quarried and distributed today. Should You Put a Shine on Your Slate Floors?